Fulfill a dead mercenary's bounty. I found a dead Orc in the bog. He carried a broadsheet, as well as a handful of sharp crocodile teeth. Find and examine the dead mercenary. 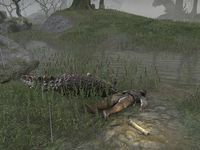 In the bogs of Hag Fen, you'll stumble across a dead mercenary next to an equally dead crocodile. The croc has been stabbed through the snout, and it appears the Orc hasn't been dead long; examine the body to confirm this and to find that he carries five crocodile teeth. A note is nearby; read it next to find a broadsheet advertising a reward for killing crocodiles in Hag Fen and bringing back the teeth as proof. Hoster Marceau, who advertises the bounty, will near Dwynnarth Ruins. Go and kill crocodiles, which are very common in Hag Fen. Two crocodiles should suffice to collect the twenty five teeth (including the five already gathered by the mercenary) needed to turn in the bounty. Head north, and find Hoster Marceau in a small camp between Lion Guard Redoubt and Dwynnarth Ruins. He'll say you're the first one to come to him with all their arms and legs, then hand you 73 gold and a chunk of XP. This page was last modified on 30 October 2018, at 21:40.